On Tuesday night me and Scott (blog) organised a Christmas Party for the Glasgow and Edinburgh Bloggers. We only had 3 weeks to plan the event so we dived straight in and got to work. We visited a few venues and as soon as we walked into October we knew it was perfect for our night and when they agreed to hold it for us we were delighted! Since October recently went through a name change and refurbishment and most people including myself and Scott hadn’t seen it yet our event was a lovely way to reveal the new look. October is a gorgeous, sleek, funky venue that really has the wow factor as soon as you walk in. October were really helpful and we couldn’t have asked for better service from Emma and Rachel and all the staff working on the night. They also provided everyone with a welcome drink which was amazing of them. Once we secured the venue we started contacting companies for items for the goodybags and the charity raffle. Scott picked the Rucksack Project, a great cause that provide the homeless with rucksacks full of blankets, food and essentials so the money donated will go towards us purchasing these items and donating at the event they will be holding this month. Thanks to its micro-crystals, Actilux® binds to the enamel of your teeth during regular brushing, creating an invisible barrier that blocks the causes of yellowing. Its photocatalytic active ingredient lasts all day and is activated by light, thus destroying dirt molecules and naturally whitening your teeth. The secret is light. Actilux® is activated by light, in way that does not damage your teeth, instead wiping away the "bad" dirt molecules, keeping your mouth clean and your gums hydrated. At the heart of all Batiste Dry Shampoos is an innovative starch based “no water needed” formulation. Adapting to your hairs needs, it targets excess oil and grease, helping to eliminate it at the roots. Boosting body it gives dull, lifeless hair the makeover that it deserves without water. Just spray, massage in and style! Sarah G Cosmetics provides trend setting, innovative, professional quality make up products. 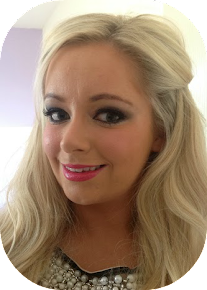 The company was established in 2011 by Make Up Artist Sarah McGough. With many years of experience in the cosmetics industry, Sarah has a strong knowledge of what women want when it comes to makeup which led her to create Sarah G Cosmetics. Braw is a health conscious food company based in Scotland. We create positive tasty foods that help people to snack guilt free anytime, anywhere. Made with 100% natural ingredients, our bars are bursting with fruit and wholegrain oats. Gluten free, less than 120 calories and one of your five a day, these are the perfect guilt free snack. Our bars are low GI, high in fibre and even give you one of your five a day. Braw bars are free from gluten, wheat, dairy, nuts, added sugar, additives & preservatives. Kent’s Kitchen has created a range of products made with quality, authentic ingredients to create delicious, tasty meals – perfect for busy people who love good food. We hand-pick the essential, natural ingredients for our products – all you need to add is a few simple components to create a delicious meal. Our range includes meal kits, noodles, marinades, stocks, gravies, sauces and rubs to add the essential ingredients to any homemade dish. Our spicy Korma meal kit won The Grocer Magazine’s New Product Award for 2012. Meal Kits includes an infused oil, paste and the essential herbs and spices to create the perfect meal in just 20 minutes. We believe in buying ingredients only from companies that do not commission tests on animals and in testing our products on humans. We invent our own products and fragrances, we make them fresh by hand using little or no preservative or packaging, using only vegetarian ingredients and tell you when they were made. We believe in happy people making happy soap, putting our faces on our products and making our mums proud. We believe in long candlelit baths, sharing showers, massage, filling the world with perfume and in the right to make mistakes, lose everything and start again. E.T. Browne Drug Company is one of the longest standing proprietors of skin and hair care products in the United States. The company has been family owned since the middle of the nineteenth century and has been under the current ownership since 1971. E.T. Browne Drug Company has been headquartered in New Jersey for over 50 years. We’re here because we believe make-up should be fun! We’re passionate about fashion, creating quality, affordable cosmetics designed to fire the creative spirit. Our customers aspire to recreate the catwalk look, from the clothes they wear and the way they accessorise, to the make-up they use. Our range of cosmetics provides them with the tools they need to stay on trend in the ever changing fashion world. Through innovation and creative development, we give our customers exciting products that spark their imagination and make enhancing their signature style easy. Nick and Louise started teapigs in November 2006. They met whilst working for a really big tea company, where they learned all about tea and drank lots of it. And the more they learned, and the more they drank, the more they came to realise something: that there's a whole world of quality teas out there that simply aren't getting the attention they deserve. And so teapigs was born. We will never compromise on quality. It also means we sell only whole leaf tea from selected estates, which we supply either as loose leaf or in tea temples. We love tea; we just don't like the snobbery that can come with it. Instead we concentrate on bringing you the very best tea we can find and not taking ourselves too seriously. The macho nacho cousin of best-selling Metcalfe’s skinny Topcorn has finally arrived! Metcalfe’s skinny Corn’ers not only contain 30% less fat than the average tortilla chip, they are gluten-free, contain all natural flavours and still manage to pack a flavourful punch. Metcalfe’s skinny Corn’ers are available in three taste-bud-tingling flavours: Chilli Tweet, Cheese Louise and Corn Off The Cob. Chilli Tweet, a combination of fiery chilli and tomato has launched in the Meal Deal in selected Tesco stores, and both Chilli Tweet and Cheese Louise will be available in itsu from 4th December. For those who can’t get enough of the crunch, Metcalfe’s skinny Corn’ers sharing bags will hit the shelves in 2014! Unlike traditional deep-fat frying methods, Metcalfe’s skinny Corn’ers are created through an innovative flash-griddled, corn popping process. This simplicity will come as a breath of fresh air, particularly to the health conscious of today. We're passionate about hand-picking the best creative small businesses to sell on our marketplace, making it simple for you to find inspired, personalised, stylish or unique things. We don’t sell one particular style. We choose sellers who offer great design and the best quality products, many of which can be customised to suit you. It’s easy to find (or create) the look or style that works for you. We were provided a gift voucher to use on the site for the party and we picked crackers and 2 Christmas photobooth sets. You will see some of the pictures at the end had some of the items in them, they were great! I love a photobooth and even at my mums house for Halloween I made one! Our theme for the night was Christmas jumper's and basically anything festive. Everyone made an amazing effort and when I looked over the pictures this morning I was so happy! Secret Santa was next up. Due to the guest list changing it wouldn't have been practical to draw out names for everyone to buy for so instead it was an extra secret sectra Santa! We set a budget and you purchased a gift, so as you didn't know who you were buying for it really was secret Santa. Next up was the charity raffle. We had lots of goodies on offer and raised over £100 which is amazing! We will update you on this and donating the rucksacks after we have attended the event. This is a selection of what was in the goodybags. We mixed things up a little and everyone got different bags including some of what is shown below. 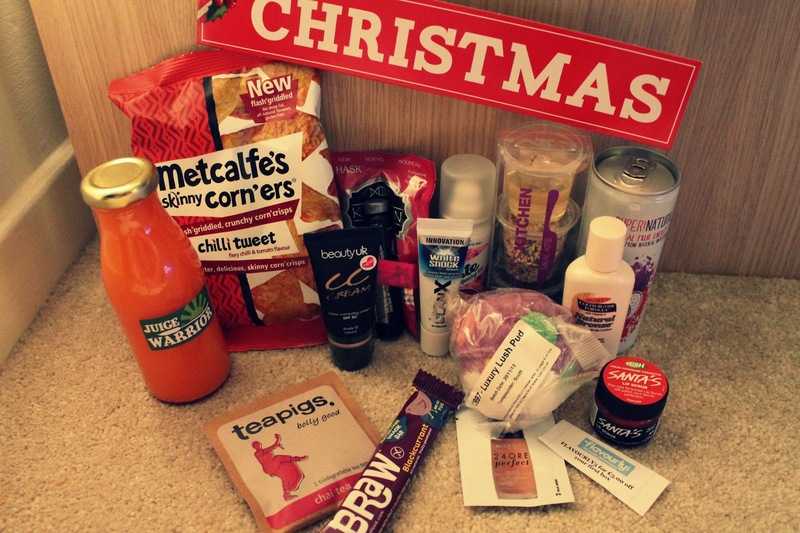 We managed to snag ourself a little bag too so I am excited to try some of these out, especially the Mercalfes Corners and Kents Kitchen Meal Kit. I will do another post in the next week or so of everyone else's pictures so you can more of what went on! Hope you don't mind if I pinch the picture with me in it?